E.V.O. 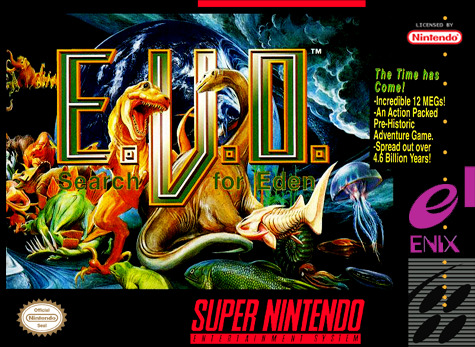 : Search for Eden for Super Nintendo has you start as a small fish millions of years ago. You've got to eat smaller fish while avoiding being eaten by bigger creatures of the sea to gain evolution points. When you earn enough points, you can evolve your character into a bigger and stronger animal. As the game progresses, your character will become diverse, intelligent, and adept as you fight for survival and to prove yourself as one of "the fittest."